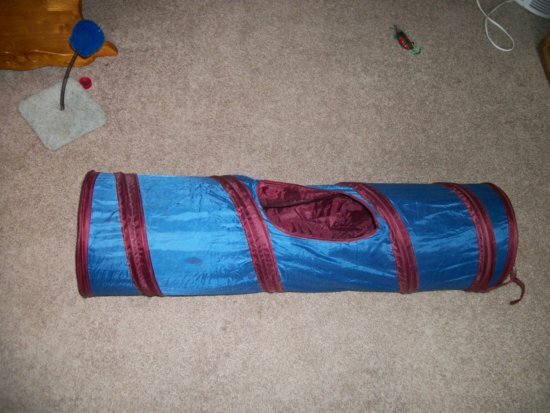 Today we are going to talk about the “Twinkle Chute Tunnel Cat Toy” purchased from PetSmart. Twinkle Chute Tunnel heavily used! The tunnel is 3 feet long, and 9 1/2 inches in diameter. It has red lights activated by motion that are inside the red bands shown above in the photo. They are powered by a common small “button” battery. There is an “on”/”off” switch so you can turn it off when not in use, and make the battery last longer. It is made of a crinkly material that makes a crinkle sound. There is an opening in the center halfway through. It has uses as a skylight, alleviator of claustrophobia, emergency exit, and spy hole. It was popular when new, and is used as well today. For a long time I had it underneath a coffee table. The red twinkle lights flash for a few seconds, every time the tunnel is moved in some manner. Other colors of this tunnel are sold today, and I do not know what color lights are inside them. Today the tunnel holds open a particular room door, so it cannot shut, and trap cats inside. Recently, the lights finally stopped working. It was not a battery problem, and I cannot fix them. The lights worked for years. The tunnel is still a good item without the lights. 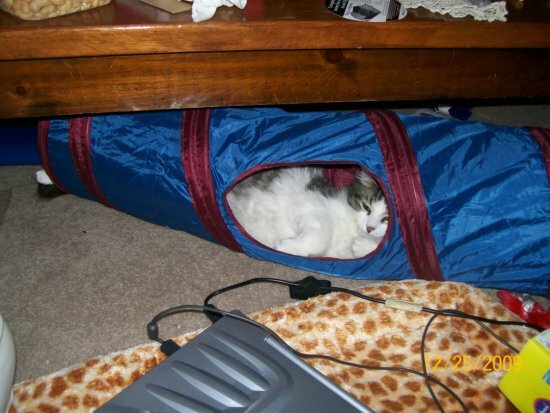 From the photo below, you can see I owned the tunnel at Christmas in 2009. Zeke is resting halfway through! In spite of the lights, it has held up very well. I recommend the tunnel with or without the lights. It sells for around $20 US. These tunnels are popular fun and DIY types can do all kinds of creative projects. They’re also good for agility training. They are also good for speeding through, and coming out the end at 60 miles per hour, scaring people! The lights are more for the people than the cats! I am thinking of purchasing another, and fastening them together. I also am thinking of cutting windows into a cardboard box to create a “new” cat house to play and sleep in. In future, we shall see how these ideas pan out! Thanks for your comments. It looks like the ultimate in creative play–and what a cozy napping spot. 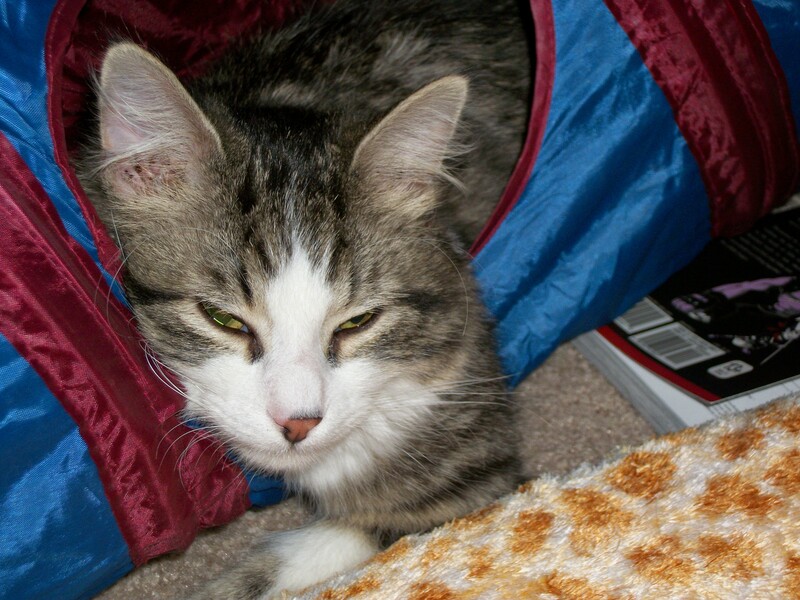 We used to have a long cardboard “schoolhouse” that our cat absolutely loved, with two windows in the side! That looks like fun. We have a tunnel, but no lights. 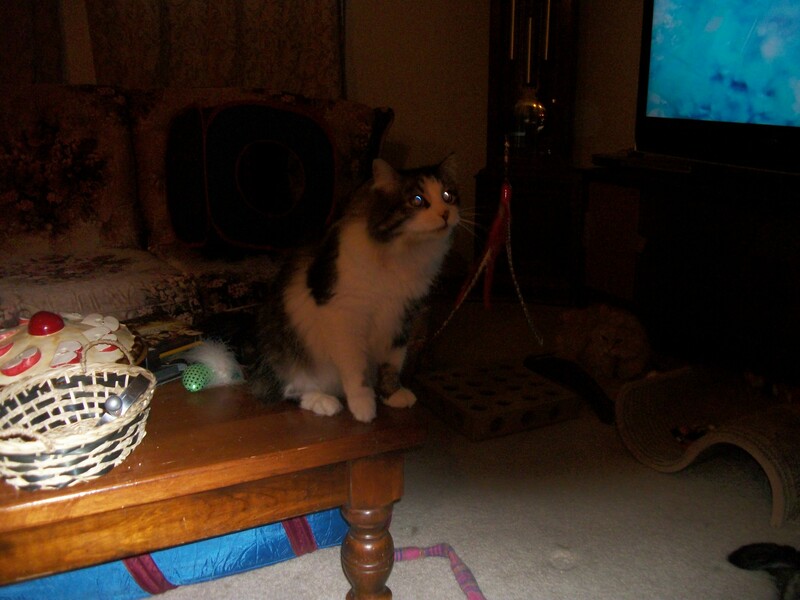 I can live without the lights, but it is exciting to hear a cat going thru and seeing the flashing lights at night!